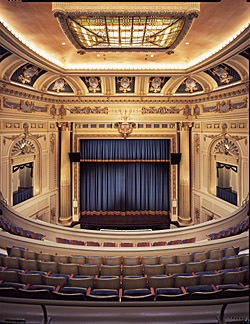 Hennepin Theatre Trust is a performing arts organization dedicated to enhancing the vitality of the Hennepin Theatre District through an array of live performances and educational experiences. With programming primarily in the historic State, Orpheum and Pantages Theatres, the Trust presents the annual M&I Bank Broadway Across America  Minneapolis season, the National Geographic Live! Speaker's Series and an eclectic range of theatre, dance, comedy and music. Community offerings include The SpotLight Musical Theatre Program, Critical View (a student reviewer program), the Starbucks Ticket Access Program and Kids' Night on Broadway. Located in the Hennepin Theatre District in downtown Minneapolis, the exquisitely restored State, Orpheum and Pantages Theatres help form the core of the region's famed "Great White Way," the foremost theatre district of the Upper Midwest. The Orpheum, built in 1921, was the premiere vaudeville house of its time hosting such stars as the Marx Brothers, George Burns, Jack Bennie and Gracie Allen. The State (1921) was the largest and most elaborate presentation house between Chicago and the Pacific Coast. The Pantages (1916) is an Art Moderne/Beaux Arts vaudeville house that was originally part of Greek immigrant Alexander Pantages' bevy of 500 theatres. During the 1980's and 90's, the State, Orpheum and Pantages Theatres were purchased by the City of Minneapolis, completely renovated and brought back to their original use as live performance venues. After it was restored, the Orpheum was chosen for the pre-Broadway world premieres of Disney's The Lion King, Sweet Charity and Victor/Victoria. Since its reopening in 1991, the State has hosted live Broadway touring productions and concerts, along with cinema events including the world premiere of the Minnesota-based film, "Grumpy Old Men." The Pantages hosts a variety of artists including Vince Gill and Mikhail Baryshnikov, celebrates local high school performing arts students through the SpotLight Musical Theatre Program Awards Ceremony and stages productions such as Sylvia and Grease through collaborations between Hennepin Theatre Trust and other local theatre companies.